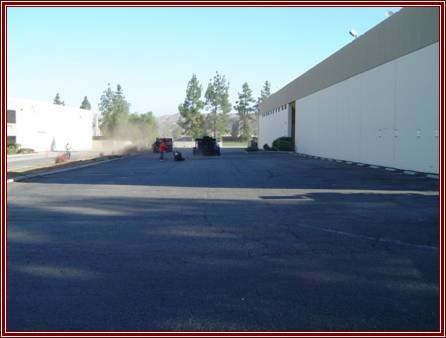 When we asked a customer who was up in years why he didn't keep his parking lot sealed, he told us years ago asphalt was so cheap, customers like him would pay to put it down and "forget about it." He said when the asphalt deteriorated, and looked like a bomb when off, he simply paid to have it replaced. That stopped being the case, as the asphalt formula changed and the price started to increase. The asphalt industry developed up a process to prolong the life of the asphalt, and "save customers money," by protecting the asphalt from erosion. That process is called Seal Coating. It's not a gimmick and it's not black paint. It literally "coats" the asphalt with the fine materials that were part of the original asphalt mix. 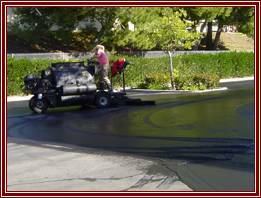 Seal Coat replaces the eroded fine materials, fills in cracks and helps to restore the smooth top layer the asphalt surface had when it was new. Industrial Building seal coat preparation. If you need to know how seal coating every couple of years saves you money, think of it this way. 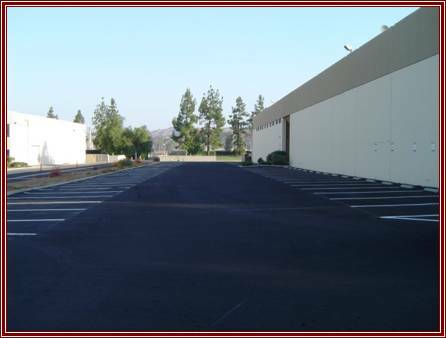 Seal coat is much cheaper to install per square foot than asphalt. Seal extends the life of your asphalt by filling in small cracks creating a water barrier to help prevent water from reaching the sub-base causing cracks and potholes. It not only saves money on the cost of replacing the asphalt, but helps to prevent trip hazards and lawsuits. Industrial Building sealed and re-striped. Seal coat being applied with seal tractor.